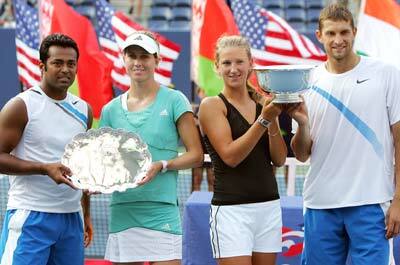 Leander Paes (IND) and Meghann Shaughnessy (USA) lost the US OPEN Mixed Doubles finals with Victoria Azarenka and Max Mirnyi of Belarus today Sep 06 2007. Azarenka and Mirnyi won the match by 6-4, 7-6 (8-6) in 2 hours . “We thought we had just about done enough to win that set but it just shows the calibre of those two that they came up with the goods when they needed to” said paes. It will be the first-ever Grand Slam title for the 18-year-old Azarenka, while the 30-year-old Mirnyi nailed down his seventh major title, all of the doubles or mixed doubles variety. Azarenka and Mirnyi will split $150,000 .